The aim of Language B is to enable students to communicate in the language of the community in which they live and in one other world language. 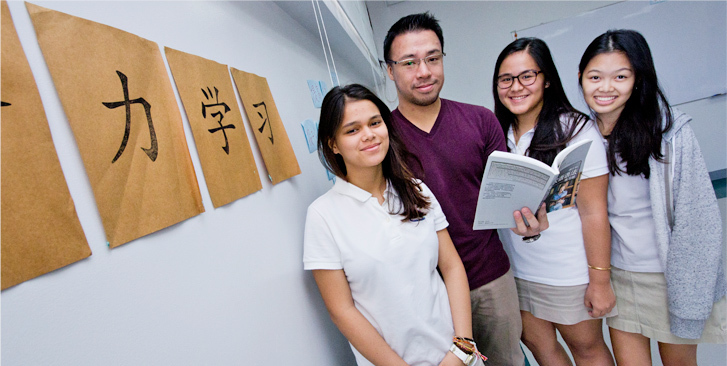 Apart from the integral Language B component of the school’s Filipino program in the MYP, students have a choice of learning either Mandarin or Spanish as an additional language. Language learning is a long and organized process. Research indicates that gaining fluency in a second language requires about 1,000 hours of study. To create a more cohesive and relevant study program in Spanish or Mandarin, we ask that each student commit to one language throughout the Middle Years Programme. Consequently, movement from one language class to another is not allowed. Parents need to discuss this language selection with their child as this will involve a serious commitment to learning that language for several years. Comprehend and communicate through listening, responding, and speaking. View, read, and respond to a variety of text. Write for a range of purposes. Develop and apply cultural understanding. Understand the system of the target language. Acquire a range of language learning strategies. At the Beacon Academy, language B is taught in the beginning phases, for students who are beginning their study of the language, and in the intermediate phases, for students who have studied the language prior to coming to the Academy. Both programs lead to Group 2 courses in the Diploma Programme. Mandarin B in the Diploma Programme is a Group 2 course that provides students with the necessary skills and intercultural understanding to enable them to communicate successfully in an environment where Chinese is spoken. Through the course, students are encouraged to go beyond the confines of the classroom, expanding an awareness of the world and fostering respect for cultural diversity. The course uses a balance between approaches to learning that are teacher-led and learner-centered in the study and use of a range of written and spoken material covering three core language topics and two optional topics. Language B across the MYP and the DP encourages students to develop an awareness and understanding of the perspectives of people from other cultures as well as harness linguistic competence. It is expected that students who took up Mandarin B in the MYP continue to take Mandarin B SL/HL in the Diploma Programme. Spanish B is an additional language-learning course designed for students with some previous learning of the language. The course provides students a more in-depth study of Spanish from that learned in the Middle Years Programme. The main focus of the course is language acquisition and the development of language skills through the study and use of a range of written and spoken material, ranging from everyday oral exchanges to literary text. Topics and materials taken up in Spanish B are of a wide range of subjects, chosen to enable students to develop mastery of language skills as well as intercultural understanding. Use language appropriate to a range of interpersonal and/or cultural contexts. Understand and use language to express and respond to a range of ideas with accuracy. Organize ideas on a range of topics in a clear, coherent, and convincing manner. Understand, analyze, and respond to a range of written and spoken texts. Language ab initio is an additional language-learning course designed for students with little or no previous learning of that language. The Language ab initio course is organized into three themes: individual and society, leisure and work, and urban and rural environment. Each theme has a list of topics that provide the students with opportunities to practice and explore the language as well as to develop intercultural understanding. Through the development of receptive, productive, and interactive skills, students will be able to respond and interact appropriately in a defined range of everyday situations.